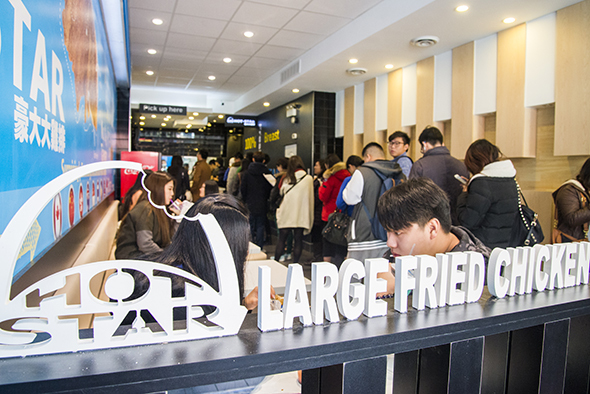 Hot-Star Large Fried Chicken has arrived in Toronto and at less than a week old the 16-seat take out counter is already commanding long lines. It's reminiscent of the Uncle Tetsu phenomenon that took place only a few blocks away. When I visited today at the tail end of lunch hour, the lines weren't snaking out the door, though a cordoned off area along the front window was ready should it come to that. Even still I waited 25 minutes from entering the building to picking up my fried chicken. Half of the time was spent waiting to order, and only once I reached the cashier did I learn that almost the entire menu was either sold out (no deep fried king oyster mushrooms for me) or yet to launch (too bad plum sweet potatoes). So I ate the original chicken. Just chicken. Out of a paper sleeve with nothing on the side. 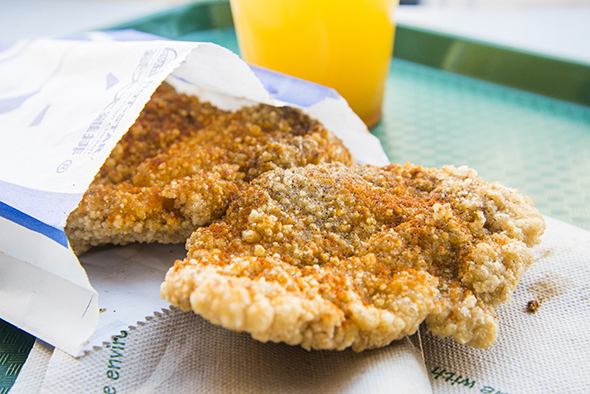 Would you queue up for fried chicken? Let us know in the comments.